You installed Rank Tracker, SEO SpyGlass, LinkAssistant and WebSite Auditor and were using them in accordance with the SEO in Practice recommendations. 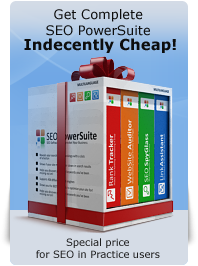 You performed all guidelines of SEO in Practice, including those not involving the use of the above software. You did not achieve growth of rankings during 1 year since you first checked your site's rankings with Rank Tracker. Create a ticket in our support system http://www.link-assistant.com/support/ telling that you own a special SEO in Practice bundle and stating the reason for a refund. Include your full name, order number, email address and date of purchase. weekly (or more frequently) collected info on rankings during the year since the first measurement. We must see your project to make sure you qualify for refund. Submit this ticket to our support service. Refund requests will be valid starting from day 366 (inclusive) after the date of bundle purchase. No refunds will be granted before this time, except for the refunds that fall within the standard 30-day money-back period. The 30-day refund guarantee applies to anyone who requested a refund within 30 days upon purchase of the product bundle. The bundle cannot be partially refunded, i.e. we will only issue a full refund and cancel your licenses for all applications coming in the bundle at once. The full refund for products cannot be granted once the rebate request has been honored. We are always ready to honor our guarantees. We try to process refunds within 5 business days of receipt, but in rare cases refunds may take up to 2 weeks to process.